This example demonstrates how a Boolean AND function operates on two or more overlapping layers of the same layer. The AND logical operator is typically used in Guardian DRC or Guardian LVS to generate additional (derived) layers that will be used in other operations. For example, transistor gate regions are not drawn, but can be created using a simple AND operation (see example and_ex01). To run this example, open a Guardian DRC session and choose File->Open to load the project "drc_and_ex02.eld" . Then in the Open Cell(s) form that pops up, select "drc_and_ex02" and select "OK". 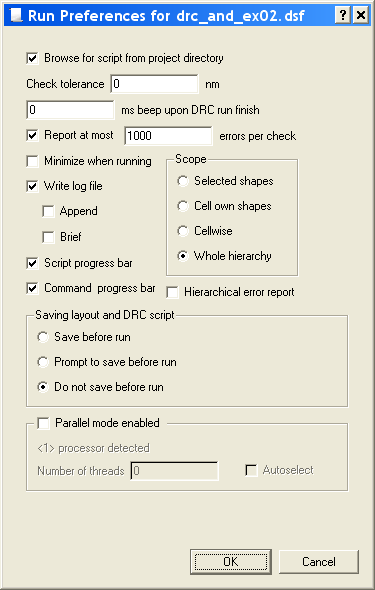 All DRC foundry rule files require layers to be manipulated in order to perform various checks. Therefore, rule developers need a method to create or derive new and temporary layers. The AND operator can be used when developers need to generate a new shape when multiple layers overlap. A simple AND function returns the union between two layers. If more than two layers are needed to form the shape, a range modifier is needed. The cell "drc_and_ex02" provided in the "drc_and_ex02.eld" project is based on the AND illustration shown in Figure 2-19 of the Guardian User Manual. Additional shapes were added to create a more robust example. Figure 1 illustrates how to use the AND operator with a range modifier to generate new shapes when two or more polygons intersect. 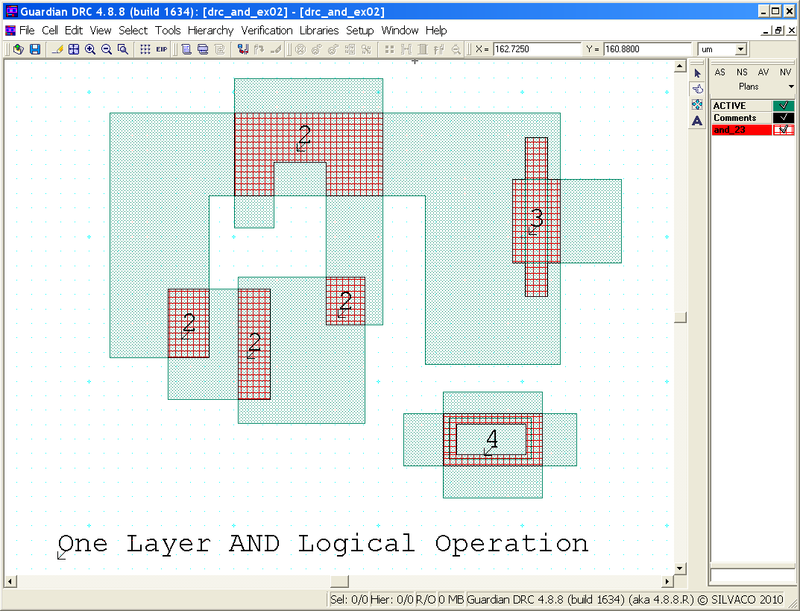 The example uses the ACTIVE layer to create a new layer called "and_23" whenever two or three ACTIVE shapes overlap. Choose Verification->DRC->DRC Script panel . In the new window, choose File->Open... and select "drc_and_ex02.dsf". In the same window, choose Setup->Current DRC script run preferences ... and set the options as shown in Figure 2 . To inspect the errors, choose Verification->DRC->Errors->Load errors... from the Guardian DRC window. Select the recent DRC results, and press the Load button located at the bottom of the window. Use Verification->DRC->Errors->First error to display the error in the layout, as shown in Figure 3. Notes: Text was added to identify the number of overlapping shapes in the various locations. In the case where four shapes overlap, the AND operator only generates a region where two and three shapes intersected because the range modifier specifies "2:3". Therefore, a hole was generated where the fourth layer intersected with the other shapes. To learn more about Guardian DRC, the different commands and their syntax, as well as the different setup options, see the Guardian DRC user manual "guardian_users1.pdf" located in lib/expert/4.8.8.R/docs/ in your installation area.